336 Marlborough is located on the south side of Marlborough, between Gloucester and Hereford, with 334 Marlborough to the east and 338 Marlborough to the west. 336 Marlborough was built in 1882-1883 by contractor and builder Samuel Tarbell Ames, for speculative sale, on land owned by his son, Harvard law professor James Barr Ames. 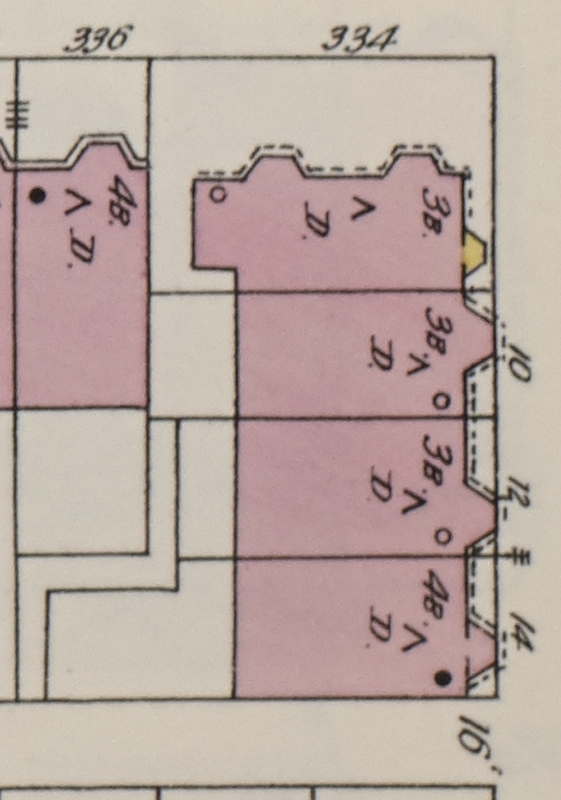 Samuel T. Ames is shown as the owner, architect, and builder on the original building permit application, dated November 22, 1882. James B. Ames purchased the land for 336 Marlborough on November 27, 1882, from real estate dealer Henry Whitwell, who had built the five houses to the west, at 338-346 Marlborough, in the mid-1870s. He had purchased the lot on April 5, 1880, from the estate of Josiah Gooding. The land originally had been part of an 84 foot wide lot running west from the southwest corner of Marlborough and Gloucester. That lot had been purchased on March 1, 1872, by builder and contractor George Martin Gibson from a real estate investment trust formed by Grenville Temple Winthrop Braman, Henry Dwight Hyde, and Frank William Andrews. The land was part of one of four tracts of land the trust had purchased that same day from the Boston Water Power Company. George M. Gibson sold the lot on June 26, 1872, to carpenter and building contractor Hiram A. Gerrish, who built 334 Marlborough and 10-12-14 Gloucester on the eastern 61 feet and transferred the western 23 foot lot to his father, George W. Gerrish. Josiah Gooding held a mortgage on the land and, on February 2, 1875, he foreclosed and took possession of the property. He died in October of 1879. Click here for an index to the deeds for 336 Marlborough. The original lot at 336 Marlborough had a 23 foot frontage on Marlborough and extended 112 feet to the alley. On December 6, 1882, James B. Ames sold the rear 23.5 feet (north-south) to Francis C. Welch, who owned 14 Gloucester, thereby permitting him to extend his property 23 feet to the west. 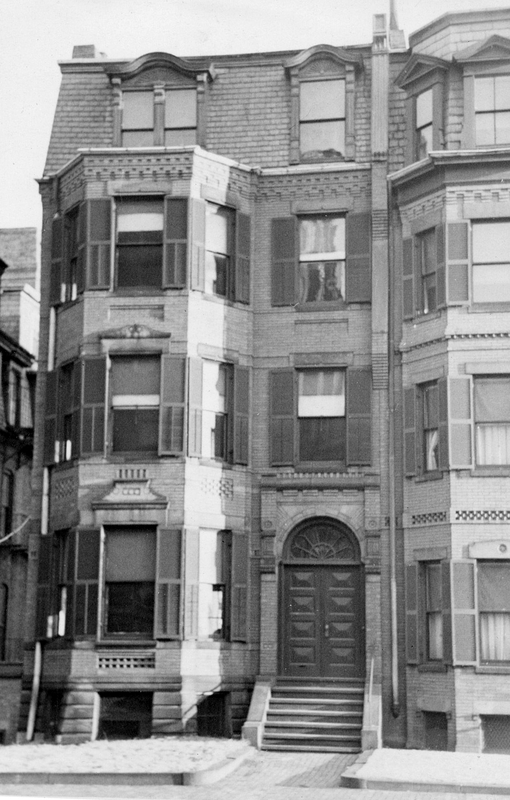 The house at 336 Marlborough was built on the remaining 88.5 feet (north-south). 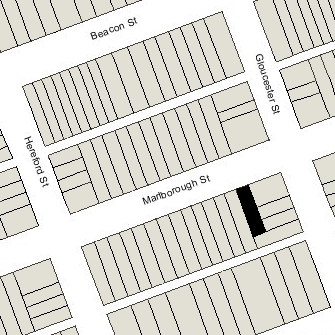 In conjunction with sale of the rear lot at 336 Marlborough, the owners of 10-12-14 Gloucester, 334 Marlborough, and 336 Marlborough entered into an agreement limiting the depth of any house built at 336 Marlborough to 64 feet from Marlborough and specifying that the eastern wall of 336 Marlborough (facing the houses on Gloucester) could have no windows and was to be built entirely on the lot for 336 Marlborough (not straddling the boundary line as was customary for party walls). The agreement also provided that no building higher than 6 feet could be built on the lot behind 336 Marlborough that had been purchased by Francis Welch. The agreement also reconfigured the existing easement to provide access to the alley for 10-12 Gloucester. Originally, the easement had run in a straight line behind 12-14 Gloucester. Under the agreement, the portion of the easement behind 14 Gloucester was re-routed to run along the northern and western boundaries of the lot at the rear of 336 Marlborough which was now part of 14 Gloucester. This modified easement provided access to the alley for 10-12 Gloucester and also for 336 Marlborough. On June 27, 1883, 336 Marlborough was purchased from James B. Ames by William Gray Brooks, Jr. He and his wife, Mary (Franks) Brooks, made it their home. They previously had lived at 11 Gloucester. In 1885, William Brooks was cashier of the National Eagle Bank. By 1905, he was treasurer of the Torrington Company, manufacturers of sewing machine needles. His brother was Phillips Brooks, Rector of Trinity Church and later Episcopal Bishop of Massachusetts. William Brooks died in April of 1912. Mary Brooks continued to live at 11 Gloucester with their unmarried daughters, Gertrude and Agnes Brooks. Mary Brooks died in October of 1913. Agnes and Gertrude Brooks continued to live at 336 Marlborough. They also maintained a home in North Andover. During the 1915-1916 and 1916-1917 winter seasons, Agnes and Gertrude Brooks were living elsewhere. By 1916, 336 Marlborough was the home of John H. Thomas, manager of the Boston office of the White Star steamship line. He previously had lived at 170 Marlborough. He married in January of 1916 to Margaret Hale. 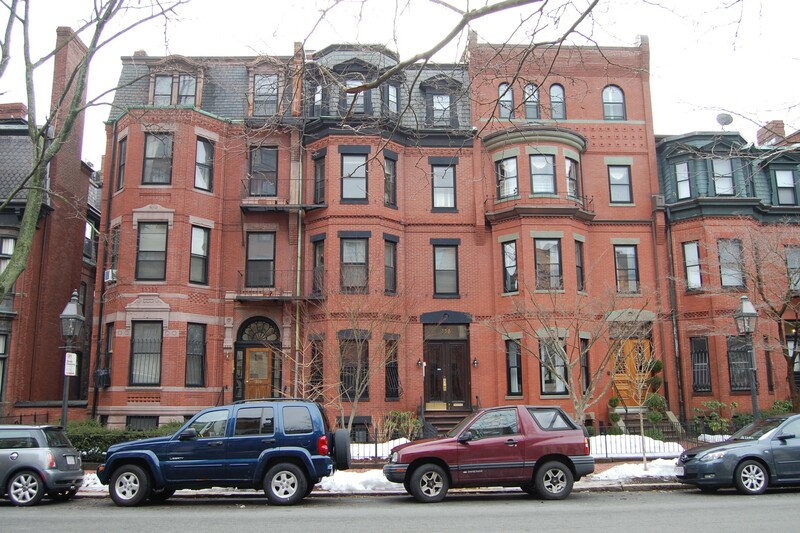 They lived at 336 Marlborough after their marriage, but had moved to 389 Marlborough by 1917. Agnes and Gertrude Brooks had resumed living at 336 Marlborough by the 1917-1918 winter season. Gertrude Brooks died in September of 1939, and Agnes Brooks died in 1940. On August 2, 1940, 336 Marlborough was purchased from the estates of Agnes and Gertrude Brooks by real estate dealer Joseph P. Brennan, and on August 7. 1940, it was acquired from him by real estate dealer Ray C. Johnson. 336 Marlborough was shown as vacant in the 1941 and 1942 City Directories. On February 25, 1943, 336 Marlborough was purchased from Ray C. Johnson by Harriet Florence (Philbrick) Robinson, the widow of Arthur W. Robinson, who operated it as a lodging house. She previously had lived at 8 Westland Avenue. Harriet Robinson’s daughter, Dorothy Henrietta Philbrick (Robinson) Sawyer, the former wife of Frederic Rollins Sawyer, lived with her. She was a teacher. 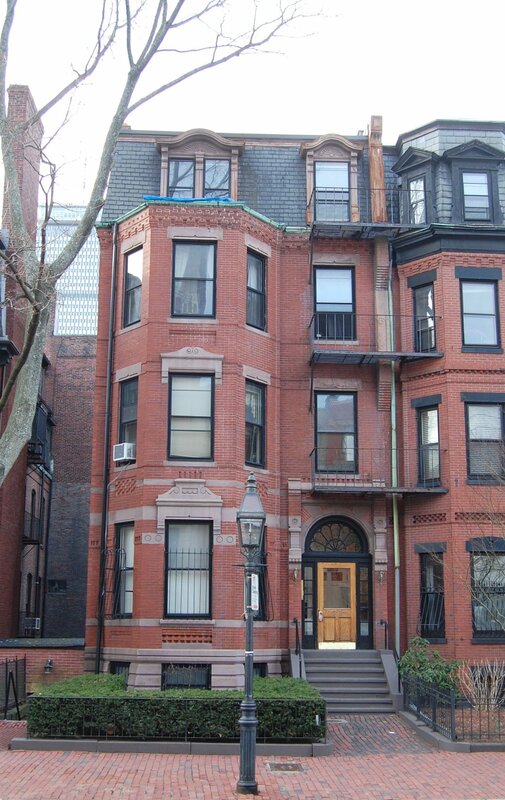 In September of 1944, Dorothy Sawyer purchased and subsequently moved to 375 Marlborough. She sold the house in March of 1945, and moved back to 336 Marlborough to live with her mother and operate the property as a lodging house. In April of 1945, the Building Department wrote Dorothy Sawyer indicating that they had been notified by the Licensing Board of her application to operate a lodging house, and advising her of the additional egress and change of legal use required before the property could be used for that purpose. In October of 1950, Harriet Robinson transferred 336 Marlborough to Dorothy Sawyer. That same month, Dorothy Sawyer applied for (and subsequently received) permission to convert the property into three apartments. Harriet Robinson and Dorothy Sawyer continued to live at 336 Marlborough in 1951, but moved thereafter. On December 11, 1951, Louis Winer foreclosed on a mortgage from Dorothy Sawyer and took possession of 336 Marlborough. On December 15, 1952, 366 Marlborough was acquired from Louis Winer by Ellen Gertrude (Costello) Hogan, the wife of Edward Francis Hogan. They lived in Watertown. In January of 1953, she applied for (and subsequently received) permission to convert the property from three apartments into a lodging house. On April 14, 1959, 336 Marlborough was acquired from Ellen Gertrude Hogan by real estate dealers Stuart H. Hastings and Joseph A. Gautreau. In June of 1959, they applied for (and subsequently received) permission to convert the property from a lodging house into ten apartments. The property changed hands and on August 28, 1986, was purchased by Gary M. Laskowski, trustee of the 336 Marlborough Realty Trust. In September of 1986, he converted 336 Marlborough into ten condominium units, the 336 Marlborough Condominium.